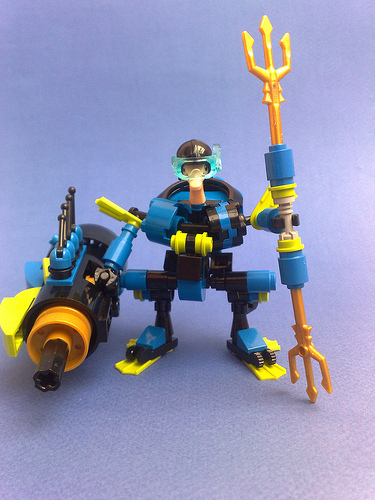 This creation by Shamisenfred isn’t a duck or a penguin or anything else that’d make sense in the context of an underwater bird mecha. It’s an ostrich wearing a hardsuit. Since I don’t own any of the new ostriches yet, I’m not sure whether the heads simply detach, or if tools are involved. In order to suit my purist heart, I’ll assume that the head was easily removed and affixed onto this body. There’s just something about the ostrich wearing goggles and a snorkel that really amuses me. I mostly had to break my own streak of not blogging anything. I agree, the goggles really make this.